The University of Mississippi is committed to providing access to quality education for students from all backgrounds. Through our Ole Miss Opportunity program, the University guarantees that eligible Mississippi resident students will receive financial aid support to cover the average cost of tuition, residence hall housing, and an allowance for meals. This program will fill the gap in funding after all federal, state, institutional, and private scholarships and grants awarded to the student have been considered. The two applications listed below are required every year. Submit a FAFSA by March 1 prior to the fall semester for automatic consideration. Ensure that the FAFSA is complete by March 31 (received by the University and verified, if necessary). Submit the State of Mississippi Financial Aid Application by March 31 (which is the same application for the MS HELP, MTAG, and MESG grants. Each student will be responsible for paying book, transportation and personal expenses. There also may be charges for special fees (i.e., study abroad or extra course fees), summer classes or intersession terms. Because Ole Miss Opportunity does not provide funding for these remaining costs, students can meet them through savings, other family resources, a Federal Work-Study job, or loans. The Office of Financial Aid will be happy to assist students with identifying additional funding sources for these expenses. 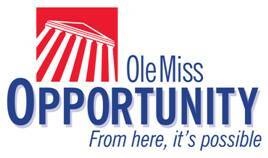 The amount of the Ole Miss Opportunity award may be reduced if the student’s financial need changes and/or if the student receives subsequent, additional gift aid (scholarships and/or grants). The level of funding is contingent upon the student living on campus. Students must live in University-owned housing for their 2nd, 3rd, and 4th years in order to get the full OMO benefits. If students elect to move off-campus, the total amount of grants and scholarships they can receive from ALL sources will be capped at the amount of base tuition. If students elect to live in University housing, they may receive the maximum grant/scholarship package. This number is updated annually for base tuition, housing, and meals. Since the housing rate in a traditional residence hall is accommodated in the OMO calculation, it will be the most affordable option. If OMO recipients choose more expensive housing, they must plan for the extra expense. If you have any further questions, please email us at finaid@olemiss.edu or call 1-800-891-4596.